Happy midweek ya'll! 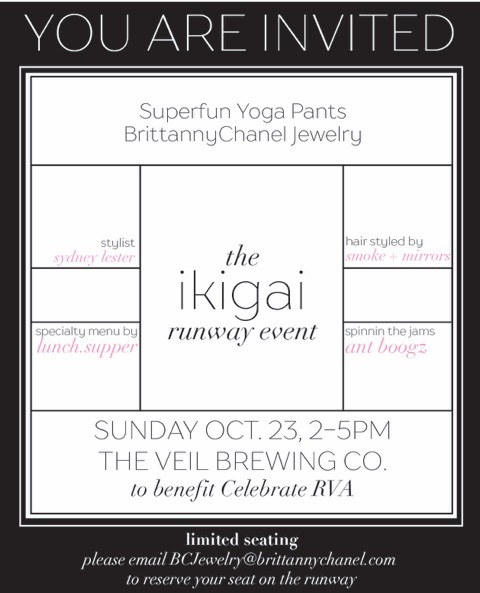 I'm super excited to invite you to the Ikigia Runway Event this Saturday in Richmond, VA. I've been dropping some behind the scenes photos and stories for the past few weeks and it's hard to believe the event is finally here. Amy from Superfun Yoga Pants approached me about working on this event towards the end of September and the stars truly aligned bringing together so many awesome RVA women, guys and companies to make this a reality. The IKIGAI concept is a celebration of doing what you love and loving what you do. Being able to "do fashion" is truly so rewarding and I love that these women dreamt up this great idea AND to top it off, have some of the proceeds from our vendors go towards supporting Celebrate RVA - a nonprofit that throws birthday parties for our community's underserved youth. I hope you can attend, support our community, drink some great beer, and shop! A collaborative event dreamed up by Superfun Yoga Pants and Brittanny Chanel Jewelry and put on in conjunction with Sydney Lester of Chic Stripes, Smoke + Mirrors Salon, DJ Ant Boogz, Lunch and Supper and the Veil Brewing Co.
A fashion-focused runway event by RVA creatives inspired by the Japanese concept, Ikigai, “a reason for being.” The goal is to bring together like-minded local designers, makers, and entrepreneurs for an afternoon of that celebrates the purpose behind their brands. A runway and storytelling event will feature local #GoodVibeTribe individuals modeling looks styled by Sydney Lester of Chic Stripes in exclusive and new pieces by Brittanny Chanel Jewelry and Superfun Yoga Pants; with elements from Molly Virginia Made handcrafted leather goods. Hair and makeup will be styled by Smoke + Mirrors Salon. Local entrepreneur and DJ Anthony "Ant Boogz" Bryant will be spinning. A custom menu will be provided by Lunch and Supper with brews from the Veil on tap. Elements from each runway look will be on hand and available to purchase after the show, as well as goods from other local Ikigai-living individuals. A portion of proceeds will benefit Celebrate RVA, a local non-profit whose mission is to create a culture of love and celebration through the simple joy of a birthday party for underprivileged children here in Richmond.